If you’re looking for a good jacket or bag, you have your choice of materials: leather, heavy nylon, waterproof synthetic weaves like Gore-Tex… but for my money (and not a little of it either) the king of them all is waxed canvas. Pliant yet protective, wind and water-resistant but breathable, handsome to start but grows a character of its own, waxed canvas strikes, for me, the perfect balance of attributes. I drape myself in it, and in the case of bags, drape it from myself. The main caveat is that it is not is cheap — sure, you can get a bag for $30 or $40 on Amazon, but if you want something that will live for years and years and get better with age, you’re going to be spending quite a bit more than that. The bags here are expensive, but like leather the craftsmanship and material quality matter a great deal in whether you end up with an item that deteriorates steadily or comes into its own. Like so many things, you get what you pay for — up to a certain point, of course. I’ve collected bags from a variety of producers and tried them all for the last few months during everyday use and trips out of town. I focused on the “fits a medium-size laptop with room for a couple of books and a camera” size, but many of these makers have plenty of variety to choose from. Ona’s bags, at least these, are aimed more at the laptop-camera combo than others, with extra padding and internal dividers for bodies and extra lenses. I reviewed the Union Street years and years ago during a previous bag week and liked it so much that I decided to buy one. It’s the larger of these two bags, fitting a 15-inch laptop and a DSLR with an extra lens or two small ones. Not only is the whole interior lined with padding, but the dividers are padded and the main flap itself has a sturdiness that has helped protect my gear against drops and kicks. The bottom, although it is also padded and feels soft, has lived through years of scooting around and placement on rough terrain. I like the spring-powered self-locking snaps, though when I first got the bag I was convinced they’d be the first thing to fail. Seven years and thousands of snaps later, they’re still going strong, and when I was worried one was failing (it didn’t), Ona gladly sent me a replacement. It was my standby for a long time, and I still have it. It has aged well in some ways, not so well in others — its waxed front has survived years of scratches and slides along the floor and is marvelously smooth and still water-resistant. I don’t know how they did it. On the other hand, some areas have worn holes and the magnet that holds the back flap shut (a smart idea) eventually burrowed its way out. The newer one feels very lightly waxed, but I know it’s in there. That said, if you want the full waxy look and feel, it could use a bit more. It’s really a matter of taste. The inside is the weakest link. The fuzzy plush interior feels cheap to me (though it’s undeniably protective), there are no internal pockets and repeated sticking and unsticking of the Velcro dividers wears the material down in places. Although being able to customize the interior space is invaluable for photographers specifically, a couple of strong decisions inside would make it a better all-purpose bag, in my opinion. The Brixton is the Union Street’s smaller sibling, fitting a 13-inch laptop and a bit less camera-wise. They share many qualities, including price (only a $10 difference) and ultimately the decision is one of what you need rather than which is better. For me it’s a toss-up. I like the open, separate pockets on the exterior of the Brixton for things like filters and cables, but the zippered front pocket of the Union Street is better for pens, phones and more valuable stuff. Personally I like the look of the Union Street better, with its riveted straps and uninterrupted waxed canvas flap. If I had to choose, I’d go with the Union Street again, since it’s not so much larger that it becomes cumbrous, but the extra space may make the difference between having to pack a second bag or not. Filson has been a Seattle standby for a century and more, with its signature waxed-canvas jackets covering the bodies of the hip, the outdoorsy and the tourists alike. Their most practical bag is this one, the 24-Hour Tin Briefcase, which as the name indicates is a little more on the overnight bag side of things. This is definitely the best generalist out of the bags I tried — it’s equally at home as a daily driver or at the airport. Essentially it’s the perfect “personal item” carry-on. When I’m leaving for a trip I invariably grab this bag because it’s so adaptable. Although it looks a bit bulky it flattens down well when not full, but it doesn’t look weird when it’s packed tightly. A bonus with Filson is that should it ever rip or fail — and I mean ever — you can take it in and they’ll fix or patch it for free. I’ve done this with my jackets and it’s 100 percent awesome. The scars where the tears were make for even more character. The handles are nicely made and thick, but tend to sort of flop around when not needed. And the storm flap that covers the top zipper, while welcome, feels like it has the snap on the wrong side — it makes attaching or detaching it a two-hand affair. When it isn’t full, the bag can be a bit shapeless — it’s not really boardroom ready. For that you want Croots or Ernest Alexander below. 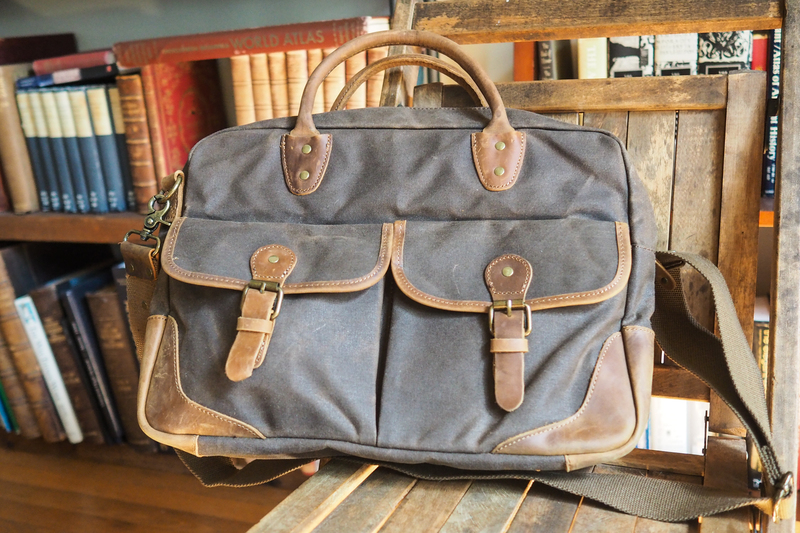 Note: I tried two bags from this maker and unfortunately in the meantime both have sold out. I’ve asked when they’ll be back on the market, but for now you can take this review as a general indicator of the quality of Ernest Alexander bags. The one I took to from the start is the Walker; it has a pleasantly sleek, minimal look on the outside, the material a handsome chocolate color that has started to wear well. But open up the flap and you have this lovely blue fine canvas inside (there’s a reverse scheme as well). To me this was the most refined of all the bags in this roundup. I like that there are no snaps, clips or anything visible on the outside — just a wide expanse of that beautiful material. It’s a slim bag but not restrictively so; if what you need to carry isn’t awkward or bulky, there’s room for a good amount in there. Books, a mirrorless with a pancake lens, laptop — sure. But you’re definitely not fitting a spare set of clothes or some groceries. The small zippered exterior pocket is great for a phone or cables, while the deep interior and exterior pockets are easily accessed and relatively spacious. If you control your loadout, there’s room for lots of stuff in here. Unfortunately, if you don’t control it, the bag gets bent out of shape easily. Because the top flap attaches to the bottom at the center, if it gets too full the whole thing bulges awkwardly and the tips flip out. And the carry strap, alas, tends to tug on the flap in a way that draws its sides up and away from the clip. And don’t even try to pick it up with the flap detached. Placing the clip underneath the flap also makes for a fiddly procedure — you have to lift up one side to get at it, and because the loop flips down when not in use, it becomes a two-handed operation to put the two pieces together. A sturdier, more fixed loop would make this easier. But it’s all in the name of style, and the sleek exterior may make up for these fussy aspects. The cross-body strap has a lot of extra material but I made it into a neat little knot. I think it works pretty well, actually. 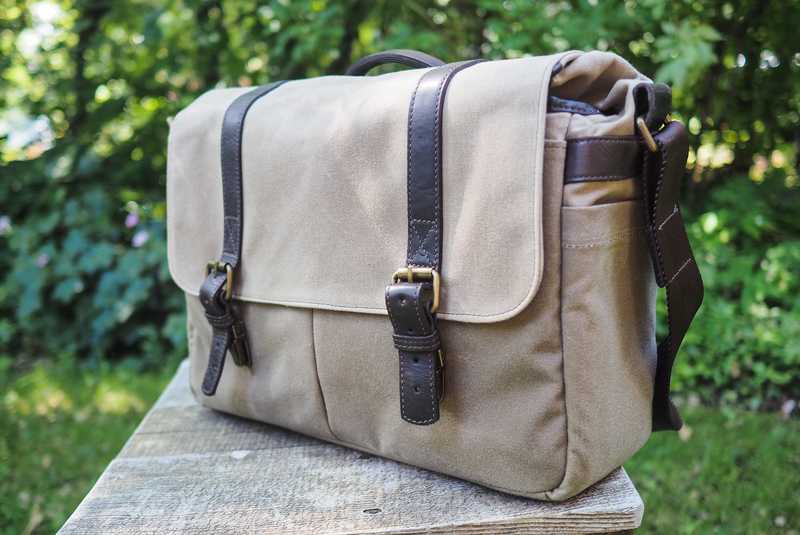 The larger Hudson messenger I was prepared to like but ultimately just can’t recommend. 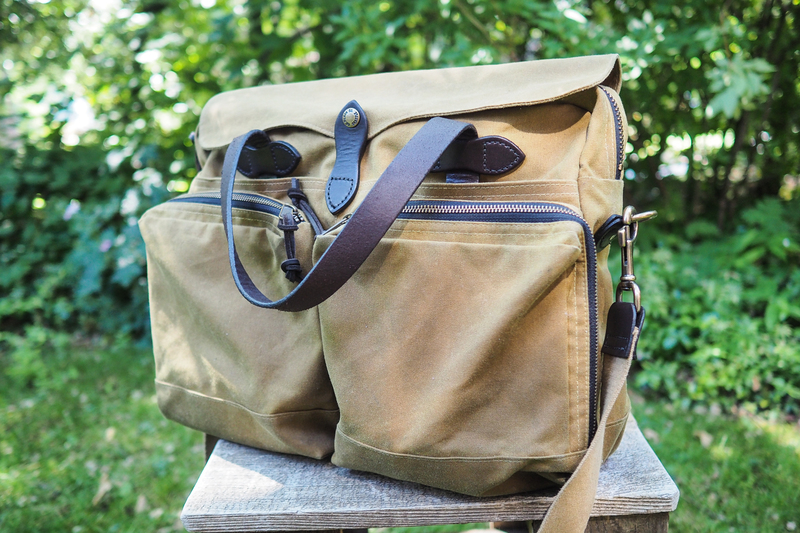 Theoretically it’s fantastic, with magnetic pocket closures, tons of room, and a cross between the simplicity of the Walker and the versatility of the Filson bag. But the closure system is just too much of a hassle. It’s two straps in a simple belt style, which are a huge pain to do over and over if you’re frequently opening and closing the bag. Compared to Ona closures, which combine speed with the flexibility of belt-style adjustment, it just takes forever to access the Hudson. If they make a revised version of this bag that addresses this, it will have my hearty recommendation. Having encountered a Croots bag in the wild one time, I knew I had to include this long-time waxed canvas player in the roundup. Croots waxed canvas is less oily than Filson or ONA, more like a heavy sailcloth. It feels very strong and holds its shape well. It is, however, on the high end of the spectrum. 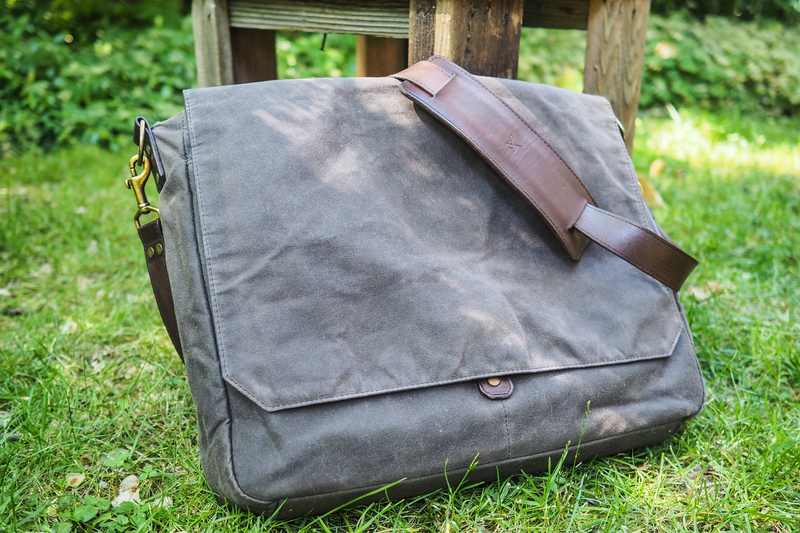 That said, because of its stiffness, the Vintage Canvas Laptop bag seems to want to wear prematurely in areas that stick out a bit, like corners or folds near stitching. The wear process shifts the material from the smooth, almost ballistic nylon texture to a rough fuzzy one that I’m not so sure about. The aging from just a couple of weeks of use already has me a little worried, but it’s also very thick canvas. 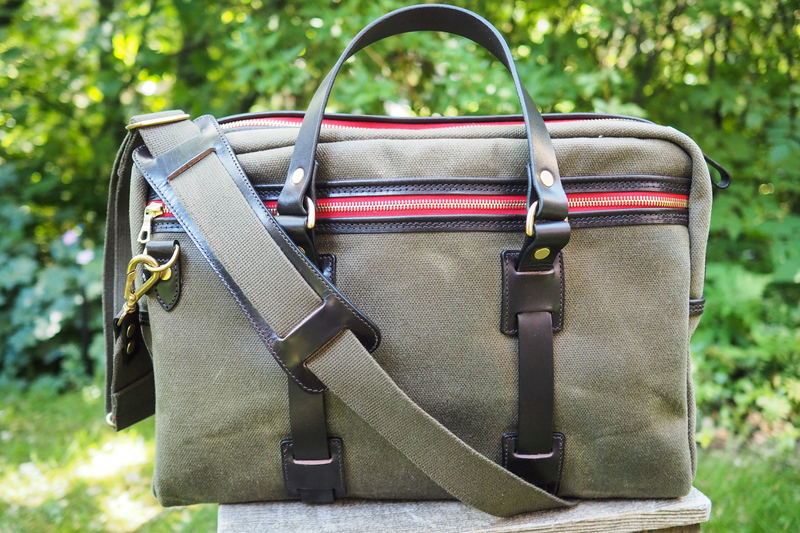 The design is a bit more busy than the Ernest Alexander bags, but very handsome and mostly practical. I love the olive color, which contrasts beautifully with the red backing for the zippers. It doesn’t look Christmas-y at all, don’t worry. The straps are a standout feature. The thick leather handles are attached below the zipper and rear pocket to D-rings, which in turn attach to separate leather straps that go under the entire bag. First this means that the handles flip down easily out of the way, since the D-rings rotate in their loops. The riveted construction also means that there’s no stitching to worry about in the whole strap assembly. And the bottoms of the loops do a little basic protection of the canvas down there. It also means that when you’re walking, the outside handle tends to flap rather ungracefully against the side; the inner one, up or down, will be rubbing against your flank or back. You can, however, stow them in the side pockets with a bit of effort, which is a thoughtful touch. The interior is a lovely shade of red, with several large loose pockets and some stiff leather ones for notebooks and so on. Unfortunately the laptop pocket is poorly proportioned: it’s hugely spacious, enough for three or four laptops to slide in, but the button to snap it shut is so low that I can’t get it fastened over a single 13-inch MacBook Pro. The idea that it could hold a 15-inch is ludicrous. There’s lots of padding, though, so I wasn’t worried about anything banging around. There’s also the option for a separate camera insert, though large SLR users will likely want to size up. The S-Zone’s fabric is a little thin but solid, rather stiff to begin with, but that’s fine — it’ll loosen up as you use the bag. The interior is a cheap-feeling synthetic, however — it’ll work, but you won’t feel like royalty using it. There’s leather detailing all over, and in some places it feels solid, like the attachments for the shoulder strap and at the corners, where there are big patches that will scuff up nicely. But the handle feels like trouble waiting to happen. Instead of a D-ring to allow it to flip down, the leather itself has been loosened up so that it’s extra bendy just above where it attaches. When it’s down, the thin rope around which the handle leather is wrapped is exposed; I can just see this getting soaked, bent, soaked again, bent, and getting weaker and weaker. The front pockets are a little tight, but I like the little magnetic snaps — they make it easy to open and close them without looking. Just be careful not to stuff too much in there or the snaps won’t hold against the pressure. There’s a good deal of room inside, more than the Croots or Ernest Alexander, but less than the ONA or Filson. But then there’s the curious design choice to put padding in the divider defining the laptop section, rather than on the outside. And the leather corner pieces stop just short of it! That means the only thing between the corner of your laptop and the ground is the nylon and canvas — and they don’t make for much of a cushion. Though the other bags don’t all have dedicated padding in this area, they do all seem to mitigate it better, and the S-Zone bag puts your laptop in the most danger of hitting the ground. Hopefully the high prices of these won’t turn you off — watch for sales and you can get even these high-end options at huge discounts (it’s how I’ve been able to afford them myself). Do you have any recommendations for more bags along these lines that we should check out for the next time we do Bag Week? Tell me in the comments!